Tampa, FL (May 6, 2016): David Weekley Homes, the nation’s largest privately-held builder, is adding more award-winning homes to the Tampa area with Redington Beach Villas. Located one block from the beach, construction has begun on the first of 16 villa homes, which will be available for sale Summer 2016. Each of the 2,400-square foot, three-story Redington Beach Villas will feature covered exterior balconies on both the first and second story. Buyers interested in finding out more about Redington Beach Villas floor plans and community events can sign up for the VIP list by contacting 866-493-3553. 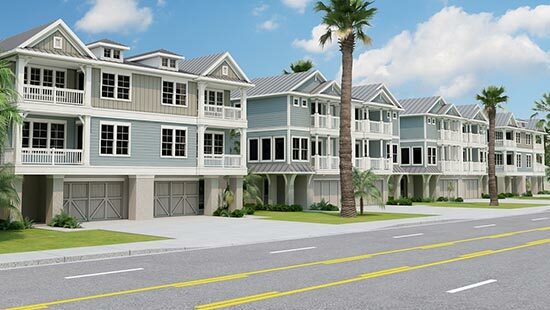 This streetscape rendering offers a glimpse of what David Weekley Homes is now building in Redington Beach Villas.